EXPERTS from the Search For Extraterrestrial Intelligence (SETI) Institute have finally given their verdict on the UFO disclosures that shocked the world last month. 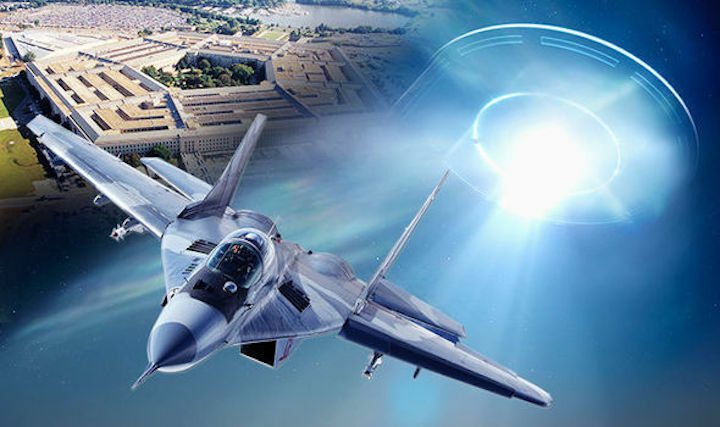 In December, a New York Times article revealed the existence of a top-secret US Department of Defense department which investigated the UFO phenomenon for five years from 2007 to 2012. The Advanced Aerial Threat Identification program (AATIP) had a £16million budget to investigate any threat posed by unidentified objects observed by the military. It was headed by Luis Elizondo, who resigned from the DoD last October to help set up the To The Stars Academy with former Blink 182 singer Tom DeLonge to further UFO research privately. The article also revealed radar camera footage from a US Navy aircraft flying off the coast of San Diego in November 2004, which was said to show a UFO that "defied physics." This footage was part of the so-called Nimitz UFO incident, in which several US Navy personnel reported seeing several tic-tac shaped UFOs over the sea, a case that was investigated by the AATIP. Mr Elizondo later went on record to say the case, and others looked at by the AATIP, showed "there was very compelling evidence that we are not alone”. The US-based SETI Institute is a collective of scientists looking for evidence of alien life in the cosmos. Now, in a radio podcast of the Big Picture Science Skeptic Check, produced at the SETI Institute, a panel of experts looked at the shocking radar video footage. James McGaha, is a retired US Air Force pilot, astronomer and director of the Grasslands Observatory, who was part of the panel. He was not convinced the video is proof of anything, let alone aliens. Bang! This isn't just an example of a rotating lens flare, but from jet engines. Only too obvious! It's from this video, and I inverted from white=hot to black=hot (perfectly reasonable to do) to compare. Mob, who was having issues with his targeting pod, was assigned to keep tabs on the circling Russian fighter while the other pilots continued with their CAS mission. He turned the Super Hornet's master mode to air-to-air and began tracking the Su-27 and searching the skies around the area for other aircraft. The F / A-18 E Super Hornet tracking video was posted, using the ATFLIR sighting and navigation system, behind the Russian Su-27 during the operation of US Navy aircraft, which resulted in the shot down of the Su-22 Syrian Air Force on June 18 this year. In the operation to attack the targets of IGIL, which was held on June 18, 2017, four aircraft from USS George H. W. Bush (CVN-77), including two F / A-18Cs and two F / A-18Es, participated. At the very beginning of the operation near the American aircraft appeared Russian Su-27, which began to observe what was happening from a great height. The Su-27 video is a clip from the VFA-31 Cruise Video, mirrored below. I think the initial front view is of a Su-34 with its canards. A little bit earlier, around 12:40, there's footage of a couple of drones, and the Su-22 shootdown at 6:11. Can you tell what's going on at 13:25? Here's the pilots' account of the shootdown. I assumed the 2X zoom is digital. It's instant and is treated differently from the FOV changes. The vrsimulations source says, "Each field of view can be further narrowed by up to 2x in 10 discrete steps." It also says that NAR is 1.5˚, but doesn't cite any references. Jane's said NAR is 1˚, but it skipped Medium FOV. There's another old reference that says, "ATFLIR’s magnification is 30X versus previous FLIR capability at 4X," which suggests 1.4˚. Near the end of the Nimitz "tic tac" video, the camera was panning at about 0.2˚/sec to track the target, and when it lost lock, the target moved a quarter of the FOV in about a second, so if the velocity was the same, then the FOV would be around 0.2*4=0.8˚. But the display may crop the 640x480 image to 480x480. That's why knowing the IFOV would help. Hay, I just made a possibly important observation... the flare rotation seen in the Su-27 video occurs as the view of the Su-27 becomes directly rear-on, ie, ostensibly also as LOS sweeps across 0˚. For what it's worth, in the latest Big Picture Science episode, retired Air Force pilot and astronomer James McGaha agreed that the video shows an airplane from behind, and that its apparent rotation was a camera artifact. In this video, hopefully I’ve consolidated the best explanations into a concise argument for the terrestrial origin of the so-called “Gimbal UFO.” Although it seems overly generous to call it a “UFO.” If I see headlights in the street, it’s an automobile, not an ET cruiser. If you see the “Gimbal UFO” in a FLIR screen, it’s unremarkably an ordinary jet. That’s what the Su-27 footage demonstrates, the un-remarkability or ordinariness of the Gimbal footage. The best explanation for a flying object that looks just like a jet, is that it's a jet. The Gimbal object looks just like the hot exhaust of a jet, so that’s it, that's the best explanation. If a tree looks like a tree, it’s not reasonably an ET disguised as a tree. Grainy-footage analyses largely reduce to “looks like.” So if it looks like something ordinary, there’s no reason to introduce an extraordinary explanation. And the Su-27 footage with its rotating flare makes the Gimbal footage ordinary, not extraordinary. So the Gimbal footage is just ordinary evidence for an ordinary phenomenon.